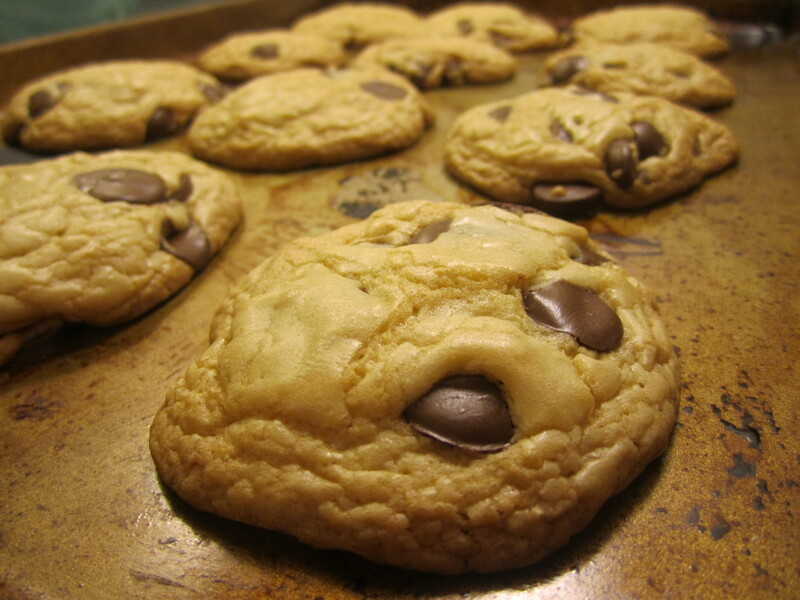 This recipe is my new all-time favorite chocolate chip cookie recipe. I’ve tried all sorts of variations – butter verse crisco, equal parts brown and white sugar or unequal parts, more and less vanilla, but I keep coming back to this one. These are close to a Toll House recipe, but better: crisp at the edges, chewy in the middle. The perfect chocolate chip cookie. This recipe makes a small batch; one to one-and-a-half dozen depending on the size of your cookie. I like it that way because what I cook, I eat…I have no self control when it comes to cookies. If you want a more traditional batch size, double the recipe. Preheat the oven to 325°F (165°C). Melt butter in a small sauce pan ofver low heat. In a medium bowl, cream together the melted butter, brown sugar and white sugar until well blended. Beat in the vanilla and egg until light and creamy. Sift the flour, baking soda and salt over the butter mixture; stir to combine.